Tamene collects data from three principal groups of people: deaf participants, teachers of deaf students, and parents of deaf children. He examines EthSL use within families, in formal and informal settings, and in various community spaces. He documents the awareness among different groups of the services available for deaf people, such as sign language interpreters and Deaf associations. He finds that members of the Deaf community show positive attitudes toward the use of EthSL and investigates the factors that impact those attitudes. His work indicates that there are still critical gaps in recognition and support for the use of EthSL, which can pose a threat to the vitality of the language. 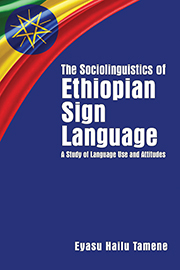 The Sociolinguistics of Ethiopian Sign Language will help to advance public understanding of EthSL and contribute to improved educational and social outcomes for the Deaf community in Ethiopia. Eyasu Hailu Tamene is an assistant professor in the Department of Linguistics at Addis Ababa University and is one of the founders of Ethiopia’s first BA program in Ethiopian Sign Language and Deaf Culture.